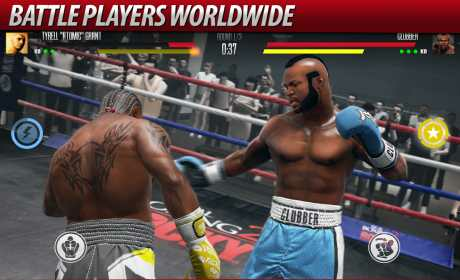 Take fighting to the next level in Real Boxing 2 ROCKY™ – the first authentic ROCKY experience for mobile! Fight as legendary Rocky Balboa and challenge Apollo Creed, Clubber Lang, Ivan Drago among many others to become World Champion! Ready for Round 2? ROCKY with unique ROCKY-themed content and fight your way to the top! 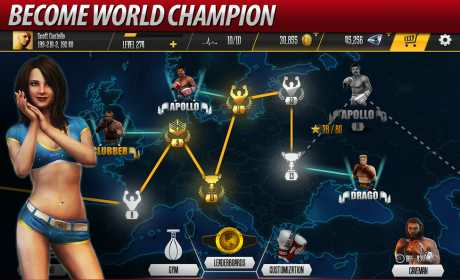 Challenge an elite of boxing champions and fight players from around the world, night or day, in single and multiplayer gameplay across hundreds of exciting events, story fights, and tournaments in a never-ending Career Mode. Master jabs, hooks, uppercuts, body punches and combine them with devastating Special Punches and Focus abilities creating the ultimate combo to KO your opponent. Take on a new type of challenging opponent, each one available to challenge for a limited time before they’re gone. Defeat them all, claim their epic gear, and use it to wreak havoc in the ring. Develop your boxer’s Strength, Stamina, Speed, and Endurance, level up your abilities, and equip powerful boosts to create your own unique fighting playstyle. Progress and gain access to a huge number of unique, upgradable and customizable gear, enhancing fighting stats and abilities of your boxer. Use a robust set of options to create your own boxer – from body mass, muscle sculpture, and attitude, to details as small as eye color and nose shape. Invite a friend and duke it out in real-time PVP action to find out who’s the best boxer right here and now. Fight for the quickest KO and best scores across a variety of leaderboards. Send and receive gifts with friends and rivals. Never stop competing! Train your fighter in exciting mini-games with legendary Mickey Goldmill and try your luck in the Daily Lottery for a chance to win awesome rewards. Witness jaw-dropping graphics fully utilizing the power of Unreal Engine 4 technology to create the most dynamic and visually stunning MMO fighting game experience. 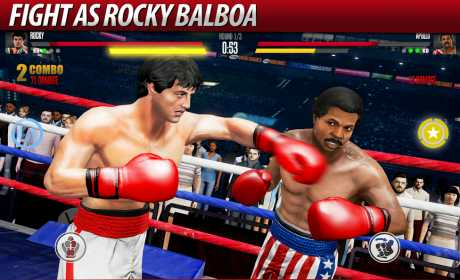 Important information: Real Boxing 2 ROCKY™ is best experienced while playing on high-end devices. The game requires a persistent Internet connection to access all features. Join the club, create your fighter and start boxing with Real Boxing 2 ROCKY™ – The Ultimate Fighting Game.